Going by the number of leaflets, you would think that the Lib Dems are the most keen for my vote with around 18 so far. Sadly most of them just put me off voting Lib Dem, and I’m still waiting for a reply to my letter to Chris Huhne. If I was voting based on quality of campaign leaflet content, the Conservatives would be ahead by a nose. Only five from them but on the whole they are much more positive and go in to more detail. Entertainingly, their major negative streak is about the dire consequences of a hung parliament, which includes a claim that financial experts predict a fall in house prices. Excellent, a hung parliament is sounding better than ever, sign me up for some of that! Labour have managed to deliver a grand total of zero leaflets. Well, saves me the effort of moving them from the letter box to the recycling bin. Have enough to fill that up already. UKIP and the National Liberal Party (that name just reminds me of a scene from the Life of Brian!) are tied on one leaflet each. 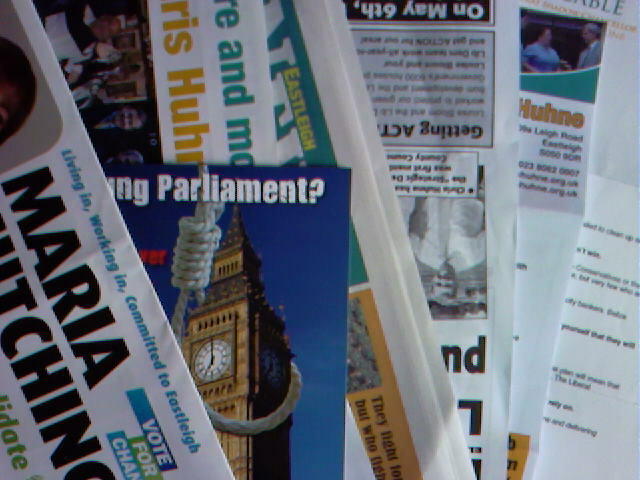 Plus we also got a random leaflet campaigning against a hung parliament. I had been planning to add leaflets to TheStraightChoice.org but with my new found apathy I haven’t got very far. I did add one scanned by a colleague after he got a leaflet from the only independent candidate standing in Eastleigh. In the past I have always been very keen that everyone should vote, but given the quality of the choices available I’m coming round to the idea that not voting may actually be the best option. (I do like the Nobody poster!) Some lucky people even get to vote for no candidate. In the end though, even if I don’t vote, I’ll be doing it in person; it’s not actually apathy, it’s lack of choice. Is blindly sticking a cross on a bit of paper once every few years just an illusion of democracy? What do you think the chances of any real change are after Thursday? Whatever happens, the politicians are going to win. Hedge End People have a General Election group and some of the candidates have responded to questions on local issues. Unlikely to help the apathy, but this article has an interesting graphic view of where the parties stand, and how the three main parties have shifted over recent years. The local Lib Dems are keen to point out that they don’t just appear at election time, which is true. Unfortunately the result is that their newsletters just tend to annoy me a lot more often. The latest front page is all about their opposition to building houses on greenfield land. Now I’m not all that keen on the idea of that either if there are alternatives, but planning seems to be a problem on the brownfield Wildern Mill site as well. (Still resisting the urge to have a real rant about local planning in general, but I’m sure it’s only a matter of time!) There’s also a reminder of previous campaigns, including the fight to stop a gravel pit. The good news is that Eastleigh does have excellent recycling collections for all the newsletters. I might be more tempted to vote for the Lib Dems on national issues, except they keep reminding me that there isn’t any point. Seem to keep a fairly low profile locally. Either that or they just don’t think I’m likely to vote for them. They often seem to be campaigning for the same things as the Lib Dems. For example, Maria Hutchings’ out of date looking web site also features the fight to protect green spaces and over development. The Conservatives biggest plus point nationally is that they aren’t Labour, and they could win the next election. They appear on the ballot paper but I have no idea what they think about local issues. Nationally, they seem to have put the unelected evil Lord Mandelson in charge, so there’s no chance I’ll be voting for them. If Mandelson keeps coming back, he’s not getting the message. There was UKIP as well last time but otherwise we don’t seem to get much more choice in Eastleigh. Not even an option to reopen nominations to give the candidates/parties pause for thought. So who can I vote for. One idea bubbling away in the back of my mind for a while is that I could vote for myself- I’d just need to get on the ballot paper. That was all before the Digital Economy Bill, which was beginning to look like it would go through without any real opposition. What can you do when none of the parties support your views? The Digital Economy Bill might still sneak through without the scrutiny it requires, handily under the cover of an election campaign so, while I would rather not stand in the election, I haven’t ruled it out completely. Scarily, I’ve already been offered the £500 deposit and a nomination! My manifesto would be simple: to stand down at the earliest opportunity. So a vote for me would be a vote for RON. Yes, a single issue candidate, but one who it’s safe to vote for. Does anyone want to join the RON party? A good way to register frustration with politicians and draw attention to the Digital Economy Bill, or a waste of time and money? Update: Eastleigh News have a handy guide to my competition. I wonder if anyone else is thinking of standing.